A Texas university professor, quietly working in her animal husbandry field of study, finds her unconventional communication techniques have put her in the cross-hairs of multiple interested parties that feel they have a license to confiscate it. Her applied research of nanotechnology, coupled with hybrid programming methods has gotten her more attention than she wanted. In the cross-hairs of several military powers the question becomes: what does research to improve animal husbandry to boost global food supplies have in common with next generation high-tech military communications? In competing for superior military power around the globe, it's not larger weapons or greater numbers of soldiers that top their wish lists. Instead, it's leveraging the latest technology improvements including nanotechnology, dynamic programming algorithms, and drones, working together to build the next generation of military communications. The race is on to be the military winner except some cyber terrorist have dealt themselves into the agenda. What challenges do these world powers need to overcome before emerging as the military winner? Keith Austin Avery, engineer and U.S. defense department contractor, is on the hunt for new technology and leading-edge applications. His research draws the attention of a powerful terrorist group,with traumatic consequences for him and his subcontractor Eilla-Zan Marshall. Can they be forced to reveal the key confidential military plans, or is all this information already on the Dark Net? The R-Group is engaged to locate these terrorists and their captives. Clarifying all data and using sophisticated analytics, they uncover more than they planned. Can they prove government corruption of a world power? Are secrets being kept from those who can help? Most importantly, how many will lose their lives in the fight to perfect advanced battlefield communications? Jacob and Petra work closely with a powerful and talented team to uncover the latest technological inroads that can take best advantage of nanotechnology. Technology programs they uncover puts them in a dire race against time to save lives. This fast-paced third installment of the Enigma Series, The Enigma Ignite, will have you keep you riveted until the very end. 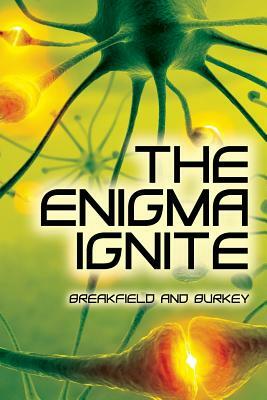 Award winning authors, Breakfield and Burkey,provide a solid espionage thriller that incorporates a satisfying balance of technology, tension, surprisingly sensitive romance, and the blurred lines that surround the age-old conflict between good and evil in the middle of the 21st century cyber playing field.